Campbell's fourth solo exhibition at StART SPACE is a journey into the heart of the mundane which reveals the miraculous. His new nocturnal paintings are scrupulously crafted records of what failing light illuminates when suburbia slows and evolves at dusk and after. The grid of twenty four canvases which form the installation, âNight Terrors' can be compared to an image bank of skewed CCTV, capturing a suburbia thrown off kilter by the slant of Campbell's imagination and psyche. The humdrum is made eerie as Outer London is re-told as a murky yarn of tall tales. Though born from a vital pulp of lo-fi music, science fiction, horror films and a twisted romanticism, these landscapes remain eerily devoid of human presence. Deeply rooted in the tradition of classic figurative painting, they are also elusively interspersed with ciphers of distraction. Exhibited individually, the painting âEmpire of the slum' is Campbell's tribute to the working class. Based on a view from the artist's hometown of Birmingham, a car park, strangely idle and serene, is loomed over by the massive presence of three council tower blocks. Lit by sodium light, silence dominates. Class, wealth and commodity are rendered obsolete; the subject is the light that muffles and flairs. 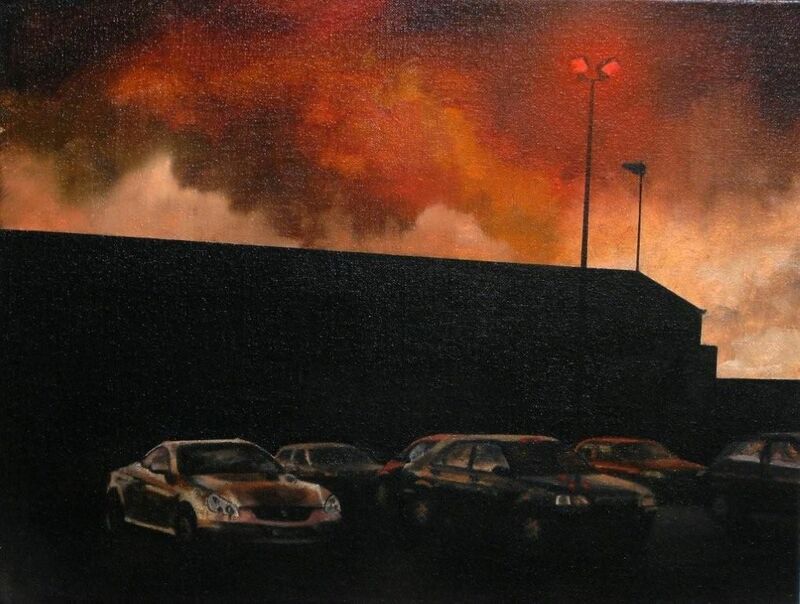 With inspiration drawn from George Shaw, Nigel Cooke, Caravaggio and many more, these are paintings of hope, undermined by a quiet dark foreboding which unveils banality's mystifying beauty. Born in 1975, Campbell studied Fine Art at Leeds Metropolitan University. Graduating in 1998, he has exhibited in the UK and the USA. His work is held in private collections worldwide. Image: Empire of the Slum; oil on linen, 50 x 75 cm For further press enquiries please contact: Eduardo on 020 7729 0522 / 07947 743 178 or eduardo@st-art.biz This exhibition is part of the East Festival, 5-10 March 2009 East is a six-day festival celebrating the best of East London's rich creative mix. Piloted in 2007 by the Mayor's Office, it is now in its third year.